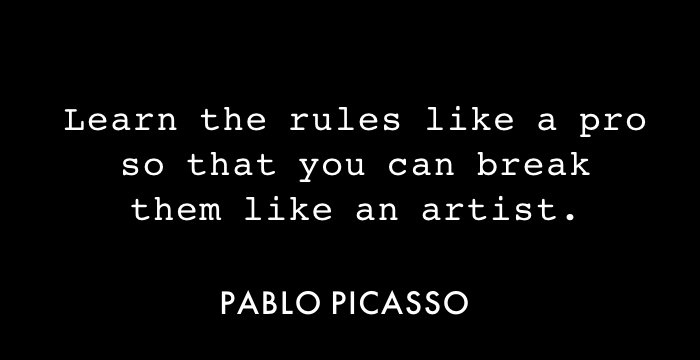 I have a thing for rule breakers. J.D. Salinger’s The Catcher in the Rye basically gives the middle finger to background introductions. Cormac McCarthy’s The Road completely ignores the existence of quotation marks. William Faulkner’s The Sound and The Fury jumps from perspective to perspective of a dysfunctional family. In a way, the writers that break the rules become the “Gods” of fiction. Their brave and daring choices burn a mark in eternity. However, I find exquisite worth in a complete story that involves sound devices. I write to make art, not color in a checkbox of “correct tenants of fiction.” Sound devices in general provide so much interest. It is more than okay to be poetic in a fiction paragraph. In fact, it is beautiful. A textured paragraph is like a jalapeño chip. It’s seasoned and spicy and hot. It’s jumping with flavor. As a reader, it makes me want more. As a writer, it makes me want to create more. Now, I can’t say all this without some disclosure. I’ve trained at art school for writing. I wouldn’t be able to understand the worth and purpose of breaking outside the box if I didn’t place myself in water to swim the basics. Overall, writing comes down to two main things for me: passion and intent. Passion creates life in a piece. I spark on a thing I care about and from there I flavor it with seasonings, such as personification, sound devices, symbolism, etc. Intent comes from deep, spiritual realization. A discovery at the end of a reading journey really wraps the bow on a whole story. It’s the perfect touch. It’s the purpose for reading. It’s the purpose for creation. At the end of the day, I find a purpose within my existence to be an artist. I don’t care about “what’s right” and “what’s wrong.” Stories belong to something that’s larger than society’s box of rules. Traveling the road of “safe fiction” in the land of writing is alright but I’m done being a tourist. If stories are islands, my goal is to climb to the top of a volcano, and splash in the hissing lava. I want to make the words on the page flicker, and I want to make them burn.